As much as we firmly believe in taking the long-term approach, let's be honest: The inevitable rollercoaster ride can test us, especially when market volatility stretches from a few days' disturbance into a regular segment on the nightly news. Headlines like "get ready for the destruction of wealth" can provoke anyone to make snap decisions. I realized that long-term investing is much like flying a plane. Turbulence is inevitable! But good pilots remain calm because they remember what they've learned about the mechanics of flying. We, too, can fall back on our knowledge during times of market turbulence. In fact, that's the only way to remain committed to your long-term approach — and not let volatility dictate your actions. So ... what have you learned about the mechanics of investing? A lot, actually. These processes are probably so ingrained in you that everything seems to run on auto-pilot. Here's what you're actually doing when you invest. How does it makes money? Where are the margins compared with the market? How did the company build a competitive moat? Did margins and returns improve over the years? How did the company perform compared with its peers and the market in a downturn? What is management's track record? Could the company expand in new geographies or launch new products? If the stock has under performed, is there a good reason? It's possible to answer each of these questions, so leave no stone unturned. From where the growth will come? What kind of growth rate can we expect? Can the company maintain its competitive advantage? What is the barrier to entering the company's market? What is the switching cost for customers? Will the landscape of the business change? How much will a company spend to fuel growth? And finally, what can go wrong? However successfully you've navigated the first two steps, you'll eventually face something you can't control or predict, such as the market bottoming out, the company missing earnings estimates, the price of oil changing, the stock getting an upgrade, the revelation of fraud, a short attack, interest rate fluctuations, or an executive announcing a serious illness. I didn't imagine these things; they're real events that triggered market overreactions. Some of them might have affected the returns of your portfolio, for better or worse. Because you can't control these surprises, the way to stay calm in their wake is to focus on what you can control: Answering the questions in steps 1 and 2. If your answers don't change after the surprise and you have some cash (dry powder is always advisable), you can take advantage of irrational market sell-offs. If you don't have money to deploy, you're better off completely ignoring the noise. Investing isn't easy, but the inevitable turbulence creates tons of opportunities. It's one of the rare instances where inefficiencies can be incredibly useful: Because of the exchange nature of the business, one right equals one wrong. So be good pilots, Fools, and remember what you've learned. If you fall back on that knowledge, volatility won't be driving (or piloting!) your decisions. was only 45K views when I watch it... bet this going to hit 7 figures! great duet, hot blonde and the brillant Kurt! Last week was a pretty good week. Stocks rallied. Went back to basics. Evaluate a business and sold options on it. Blue Nile & Disney was my choice. Did a vertical spread on TJX. While I learn how to manage my $$ better, some habits I formed. I learn the sooner you put your money to work, the more time it has to grow. It can be the difference between retiring early and never retiring. Think about this: If you invested $10,000 and left it to grow for 40 years, assuming an average return per year of 8%, you would end up with over $217,000. But if you waited 10 years and invested $20,000 — twice as much — you would only end up with just over $200,000. Whatever your situation might be, saving and investing money today is better than waiting until tomorrow. Start now. You can be your own worst enemy when it comes to financial success. It’s all too easy to procrastinate and neglect what needs to be done and, meanwhile, give in to temptation and spend more than you should. It’s the perfect recipe for not becoming rich. The best way to protect yourself from yourself is to automate your savings. That means setting up recurring transfers on a regular basis from your checking account to your savings and investment accounts (or setting up auto deduction from your paycheck to your employer-sponsored retirement plan). This way, you force yourself to avoid bad money habits and save what you would likely otherwise spend. If you haven’t already, set aside 15 minutes on your calendar now to do it. Not later, now. Your rich future self will thank you. Have you ever met someone who is unassuming and modest and then were surprised to later learn that they are actually rolling in dough? I had an older client who was stuck in 1983: he wore ugly brown suits and running shoes, drove a beat-up baby blue Volvo station wagon and lived in the same modest house he bought 40 years ago. Turns out, this man was an uber-successful entrepreneur and multimillionaire — and even richer because of his humble habits. Millionaires are all around us, and many of them are probably not who you would think. This is because they smartly live below their means and save their money rather than showcase it. Of course, it’s easy to live below your means when you have millions, but even if you have far less, getting into the habit of spending minimally now will help you have a lot more later. The trick is adopting a “less is more” mentality and sticking with it, even when your income and net worth increase in the future. Successful investors also know not to put all of their money eggs in one basket—or two baskets, for that matter. They spread their wealth across a variety of investments, from stocks, mutual funds, ETFs and bonds, to real estate, collectibles and startups. A diversified portfolio means that you can potentially take advantage of multiple sources of growth and protect yourself from financial ruin if one of your investments bombs. An easy way to achieve diversification is to invest in an asset-allocation fund, such as a target-date fund or “life strategy” fund that is based on your risk tolerance. And if you don’t have the means to buy property outright, you can explore investing in real estate mutual funds, ETFs or investment trusts (REITs), which can even offer steady income in some cases. Learn more about crowdfunding, which now gives the average investor the ability to support startup companies. Just be careful not to concentrate your money too heavily in any one investment. Pretty interest info graphic. 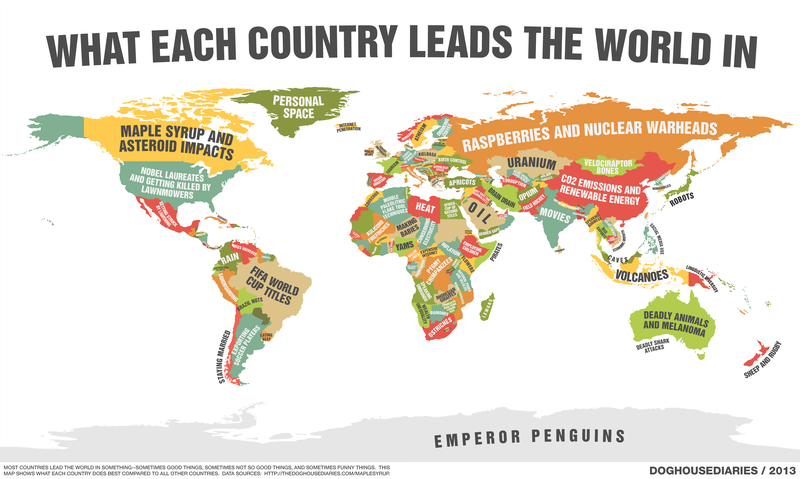 What country leads the world with. Singapore, Science?? LOL.. yar sure..